This remarkable tale from missionary Chrissie Chapman shows God's protection and power when it is needed most. Want to read a story like no other? Trained as a midwife, Chrissie Chapman went to Burundi in the eighties to open a maternity clinic and dispensary in a rural area of the country. She had been there just three years when a coup was declared, and the country descended into a state of civil war. It lasted for thirteen long years. During that time, God directed her to work with the orphans and widows. She started a centre for abandoned babies and traumatised children and saw the Lord performing remarkable miracles in the lives of people who had lost everything. Chrissie adopted three children herself, and has raised more than fifty others to young adulthood. Again and again she has witnessed miracles of protection and provision. When the war started Chrissie, her adopted children, and the health staff were living in a rural location on top of a mountain, in a healing centre, with maternity clinic and dispensary. Every night there was gunfire, and every day people would come seeking refuge. One night, she and David Ndarahutse, the mission director, were sitting praying amid the fighting, when David said, "Chrissie, look up." There were dozens of angels standing on top of the walls of the healing centre. That was the night the angels came. "From that moment on," Chrissie records, "I have never experienced or felt fear for my life." Today Chrissie divides her time between Burundi, where she continues to care for the teenagers in her charge, and England, Canada and America, where she speaks widely about the faithfulness and power of God. 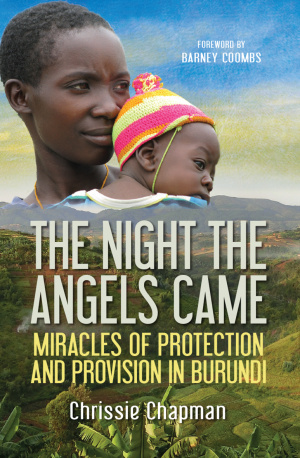 The Night the Angels Came by Chrissie Chapman was published by Lion Hudson Plc in February 2016 and is our 785th best seller. The ISBN for The Night the Angels Came is 9780857217226. Got a question? No problem! Just click here to ask us about The Night the Angels Came.